Artist's illustration of a spacecraft orbiting the odd metal asteroid 16 Psyche. You can see and learn about the huge, bizarre metallic asteroid 16 Psyche — the target of a newly announced NASA space mission — during a free webcast by the Slooh Community Observatory Friday evening (Jan. 6). The show will feature live views of the 130-mile-wide (210 kilometers) 16 Psyche from Slooh's telescopes at the Institute of Astrophysics of the Canary Islands. You can watch the webcast at Slooh.com, beginning at 9 p.m. EST Friday (0200 GMT on Saturday, Jan. 7). Scientists think 16 Psyche, which lies in the main asteroid belt between Mars and Jupiter, is the exposed core of an ancient planet whose outer rocky layers were stripped away by long-ago cosmic impacts. Astronomers know of no other object like 16 Psyche, and studying it up close should yield exciting insights about planet formation and the solar system's early days, said a team of researchers mapping out a space mission to the metal world. 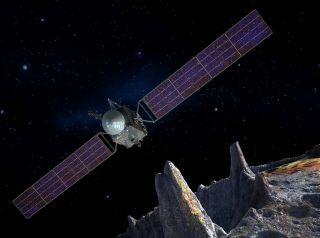 If all goes according to plan, the Psyche probe will launch in October 2023 and arrive at the metal world in 2030, mission team members said. The spacecraft will then spend about 20 months studying 16 Psyche from orbit, using a variety of instruments to investigate the object's composition, magnetic environment, gravitational field and other characteristics. "Humankind has visited rocky worlds and icy worlds and worlds made of gas, but we have never seen a metal world," mission principal investigator Lindy Elkins-Tanton, of Arizona State University, said during a conference call with reporters Wednesday. "Psyche has never been visited or had a picture taken as more than a point of light, and so its appearance remains a mystery. This mission will be true exploration and discovery." The Slooh webcast will discuss the newly announced mission and its science goals: Psyche team member David Lawrence, of Johns Hopkins University in Maryland, will join Slooh host Gerard Monteux and Slooh astronomer Eric Edelman for the show. Viewers can join in on the webcast and ask questions about 16 Psyche and the mission by tweeting @Slooh or by joining the live chat on Facebook.